SAFECORE VC is rapid curing, 2 pack Vinyl Ester based coating with outstanding resistance to aggressive acids, solvents and alcohols and other chemicals. This product is designed where high chemical resistance is of primary requirement. Due to its high molecular weight and low permeability, it will withstand exposure to a broad range of acids, caustics, and solvents. SAFECORE VC is designed for coating primary and secondary containment, trenches, troughs, pump pads, equipment, and structural members. • Excellent resistance to a wide range of chemicals. • High temperature performance; in many cases up to 350°F (spills) or 400°F (dry heat). • Excellent adhesion to steel & concrete. • Vary rapid cure, even at low temperature. • Tough durable and abrasion resistant. 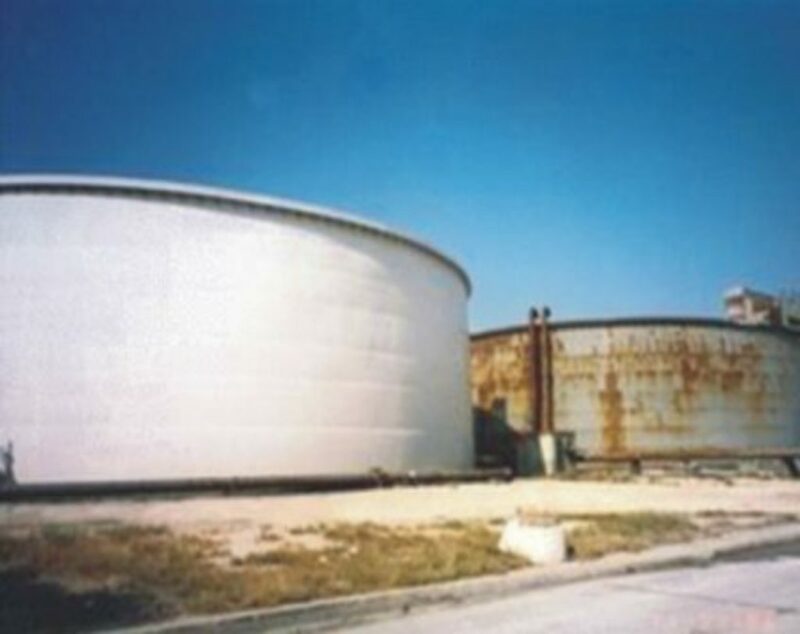 • Can be used as an internal lining for concrete or steel storage tanks. • For chemical resistant floor/wall coating for chemical and printing works, bottling and canning factories, pharmaceutical production etc. Steel – The surface should be free of oil, grease, dirt, mill scale, rust, corrosion products, oxides, paint and other foreign matter. In absence of blast cleaning, prepare the metal surface by wire brushing, sanding. The surface should be pretreated with emery paper or all rust should be removed with SAFECORE RR. Concrete Surface: Concrete shall be minimum of 21 days old and/or residual moisture content shall be below 6%. Ensure that the concrete is clean and free from dust, laitance oil, curing compound, existing paint finishes etc. Blow holes and defective concrete should be made good using a proprietary void filler FAIRSCREED VF. MIXING : SAFECORE VC PRIMER is supplied as ready to use in pre-weighed packs of base and hardener for easy application on site mixing. Pour the hardener into base cane, mix well using paddle attach to an electric drill until uniform colour is produced. APPLICATION PROCEDURE : SAFECORE VC PRIMER may be applied by brush , roller or airless spray to give continuous coating on prepared surface. After proper surface preparation apply one coat of SAFECORE VC PRIMER and allow it to dry completely. NOTE ; For technical details refer the Separate Technical Datasheet of SAFECORE VC PRIMER. MIXING : SAFECORE VC is supplied as ready to use in pre-weighed packs of base and hardener for easy application on site mixing. Pour the hardener into base cane, mix well by chemical means until uniform color is obtained. APPLICATION PROCEDURE : When primer dries completely apply one coat of SAFECORE VC . SAFECORE VC may be applied by brush , roller or airless spray to give continuous coating. After application allow it to dry completely. 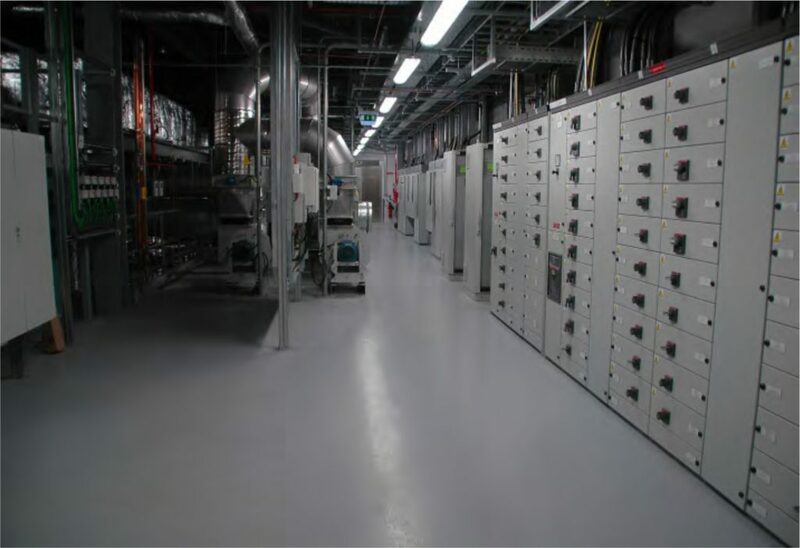 For slip resistant finish broadcast SAFECORE ANTI-SLIP GRAINS immediately after first coat application. After proper curing( at least 10 hrs) brush off excess aggregate and apply Second final coat of SAFECORE VC. CURING: Allow to cure for minimum of 12 hours @300C for light foot traffic and 24 hours prior to vehicular traffic. Allow a minimum of 3 days cure at 300C for optimum chemical resistance. CLEANING : Tools and mixers should be cleaned with SAFECORE TOOL CLEANER immediately. PACKING & COVERAGE : SAFECORE VC is available in 1Kg & 5Kg packing . A 5Kg pack is sufficient to coat 5-6m2 of surface with the 1 coat treatment with DFT of 150-200 microns. SHELF LIFE & STORAGE: SAFECORE VC will have a shelf life of 3 months in unopened containers when kept in a dry condition at temperature between 50C to 450 C. Storage at higher temperature or high humidity may reduce shelf life. • High build properties ensures rapid application. • High elasticity, ensuring a permanently flexible barrier over a wide range of temperatures. • Screeding can be done easily over applied membrane after complete curing. • For Extended Life Waterproofing, application with GRS (Glass Reinforcement Sheet) is recommended. • Good Crack bridging property. • Can be applied to range of substrates. • Outstanding resistance to brittlement and oxidation. WATERGUARD LIQUID MEMBRANE (WHITE) is a single component White colored is a highly elastic tough waterproofing system based on special co-polymers & fillers. WATERGUARD LIQUID MEMBRANE (WHITE) is highly resistant to aggressive soils and soluble salts providing an effective continuous barrier and protection against water borne damage. WATERGUARD LIQUID MEMBRANE (WHITE) is ideally suited as vapor/salt barrier to building facades behind granite, marble, stone cladding, and curtain wall elements. • Useful as protective coating on concrete and brick foundations, retaining walls, timber etc. • Provides a sandwich membrane in new construction and surface treatment on existing slabs. • Provides a key for plaster on difficult surfaces. 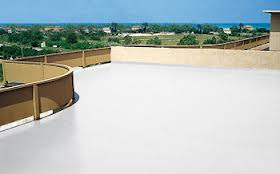 • For waterproofing and protection of structure, concrete, columns and beams. • Used for the external insulation of foundations, underground constructions, basements. etc. • Used for insulating water leakages in closed damp environments such as bathrooms, kitchens, toilets, etc. • Service life can be further extended by using GRS (Glass Reinforcement Sheet) in application. No especially skilled person required for its application. It provides a seamless insulation layer. As a water-based material it is environment friendly. Because it contains water, it enables good adhesion even when the surface is moist. It provides permanent elasticity. It is ready to use. Cold applied material, it does not require heating or thinning. It can normally be applied by brush. Very much useful for Waterproofing purpose. SURFACE PREPARATION : All substrates must be sound, clean,dry, smooth and free from protrusions, voids, honey-comb, sand high spots. Presence of curing agents, paint and oil will impair adhesion. Moss and lichen must be removed and area treated with proprietary fungicidal wash to kill spores and inhibit further growth. Following treatment wash area thoroughly with Clean water and allow drying. Fillets must be provided at corners or sharp angles using 4:1 sand and cement mortar modified with a good quality bonding agent FAIRCRETESB(L). 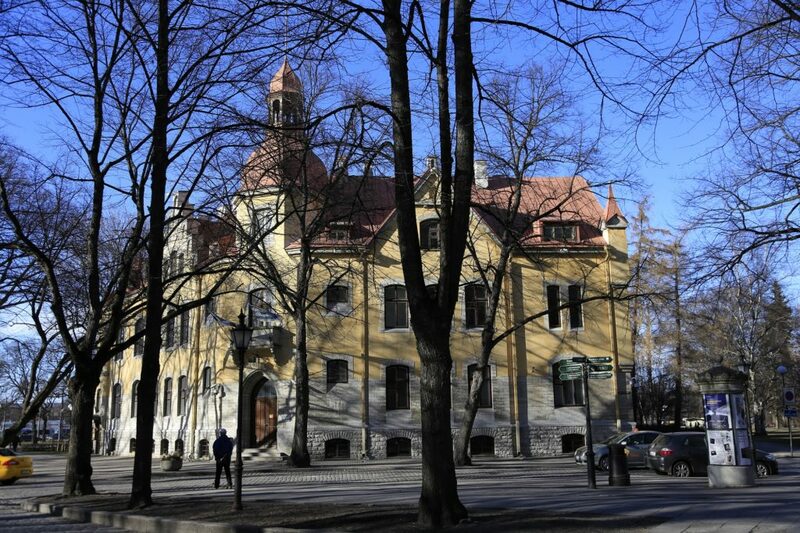 PRIMING : Priming is not normally required on good quality, well prepared substrates. APPLICATION : WATERGUARD LIQUID MEMBRANE (WHITE) should be applied by brush to obtain a continuous unbroken film. Four coats are required to achieve a better performance. Each coat should be applied after proper drying of previous coat. For application with GRS (Glass Reinforcement Sheet), first of all apply one coat of WATERGUARD LIQUID MEMBRANE (WHITE) then after put GRS (Glass Reinforcement Sheet) on applied material & sheet should be spread when first coat is Wet. After spreading GRS (Glass Reinforcement Sheet) roll the Paint roller over it to ensure that sheet is bonded with applied material & no air pocket has been left in between contact of applied material & GRS (Glass Reinforcement Sheet). After that apply remaining subsequent coats of WATERGUARD LIQUID MEMBRANE (WHITE) over it. WATERGUARD LIQUID MEMBRANE (WHITE) must be protected from mechanical damage during subsequent construction or backfilling works. Any damage may be repaired by spot application. If a water flood test is to be run, the membrane should cure for a minimum of 10 days. Whilst WATERGUARD LIQUID MEMBRANE (WHITE) is resistant to frost, adhesion will be impaired if applied to frosted substrates. Application should be avoided if substrate temperatures are below 5ºC or rain is imminent. On Exterior application, applied material may become Bone White after an instant of period but this will not affect or alter the performance of WATERGUARD LIQUID MEMBRANE (WHITE). Cleaning : Application equipment should be thoroughly cleaned after use with Water. Spillages should be absorbed with sand, vermiculite or similar and be disposed of in accordance with local regulations. WATERGUARD LIQUID MEMBRANE (WHITE) is supplied in 1kg, 5 kg, 10 kg & 20 kg pails. It has coverage of around 1.1 kg/m²@1 mm thickness.